This blog was featured in The Huffington Post on May 16, 2014. I’m beyond thrilled to head to my home state of Texas in July to teach a series of classes, Dining with Matisse, inspired by the special exhibition, Matisse: Life in Color, at the San Antonio Museum of Art. French food, art and culture are on my mind. 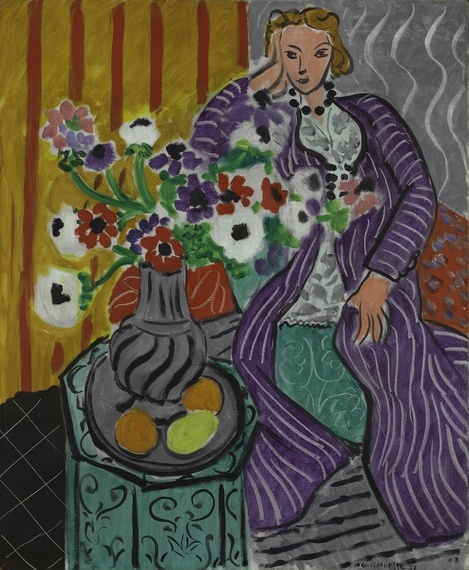 Matisse lived during France’s Belle Époque. Café culture was at its height, and cafés were where artists came together to exchange stories, discuss ground breaking artistic styles, and eat good food. This good food has a history. By the reign of Louis XIV (1643-1715), chefs were revered; their recipes guarded like crown jewels. Great chefs wrote treatises on the arts of carving and serving and the complexities of gastronomic etiquette. It was during his reign that classic French haute cuisine was born. Chef François La Varenne was the first to put these innovations in writing in his 1651 cookbook Le Cuisinier françois (The French Cook). At the end of the century François Maissialot introduced his famous Cuisinier royal et bourgeois (The Court and Country Cook), with folding pages devoted to table settings. Culinary opulence among the court and the bourgeoisie made Paris, a city of great cultural achievement and creativity, the country’s gastronomic capital. Under the reign of Louis XV (1723-1774) French cookbooks became grand productions; the most spectacular of these being Vincent La Chapelle’s Cuisinier moderne (The Modern Cook) of 1742. La Chapelle’s book announced the birth of nouvelle cuisine, a new style of cooking that emphasized simplicity and the use of fresh, seasonal ingredients. This style would be adopted by several generations of French chefs. Ironically, the use of simple ingredients went hand in hand with luxury ware and theatricality in the dining room. But changes were on the horizon. The Revolution of 1789 began to level the political and socioeconomic playing field. It was also a great culinary equalizer. The fall of the royal regime created a more egalitarian cuisine, restaurants dotted the Parisian landscape. Café culture flourished. Pleasures of the table were united with those of the mind and gastronomic literature continued to flourish. Authors and chefs Antonin Câreme and Brillat-Savarin — whose 1825 work Physiologie du goût (The Physiology of Taste) is still published today — became household names and authorities on the art of dining. This was Matisse’s France. I can’t wait to weave art and culinary history at the San Antonio Museum of Art. Bon appétit! My favorite vinaigrette is adapted from Amanda Hesser’s classic recipe. It’s very French in its elegance and simplicity, and it’s great on absolutely everything. This entry was posted in Blog on May 16, 2014 by lightray.